Always wanted to make a wreath but not sure how? Here's your chance to contribute 2 wreaths to Festival of Trees and receive expert guidance in wreath-making! All supplies included (supplies & wreaths! ), along with snacks. $20 contribution appreciated. Call Rivercross at 828-963-8623 to register. Make a wreath in class; take a wreath to replicate; donate both to support WYN's programs & be part of the fun! Limited to 10 participants total. Head to Lost Province in downtown Boone and test your holiday trivia. 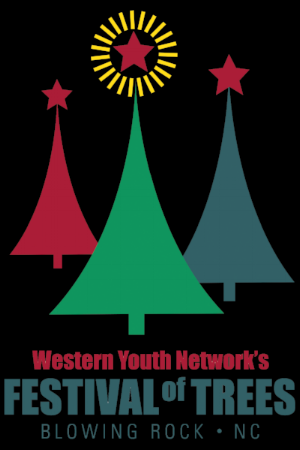 Learn about Festival of Trees and WYN in a fun & competitive environment. Donations accepted! Please join us as we honor and spread holiday cheer to our active military, retired military, and veterans and their families who can enjoy the Festival during this time free of donation, courtesy of COL (Ret) Sonny Sweet & LTC (Ret) Bricca Sweet, founders of the Sonny Sweet Scholarship Fund in support of WYN kids. Presentation of Colors will occur at 4pm, brought to us by the WHS ROTC. Free gift and special raffle offering during this time. Wander through the magical Christmas tree wonderland, with a special visit from Santa and Mrs. Claus! Bring the kids for this photo opportunity and lots of fun for all ages. Donation appreciated. Enjoy the fantastic Festival of Lights, nightly at sunset on the grounds of Chetola, along with the indoor Festival of Trees (Hosted Nov 29-Dec 2). Two Festivals in one great space for a limited time! Sky Country Transportation Services, Inc.
College Access Partnerships at A.S.U.